Dead Zone:Garlic Jr. is on the hunt for the seven Dragon Balls, and Gohan lands on the hit list when he refuses to surrender his own magic orb! Goku is ready to fight to save his son, but the situation takes a dire turn after the pint-sized villain summons Shenron and wishes for immortality! Next stop, the Dead Zone! The World’s Strongest:After his cunning assistant gathers the Dragon Balls, the sinister Dr. Wheelo is finally freed from his icy tomb. The deadly duo plans to conquer the world with their brilliant biotechnology, but first they must find a body worthy of the doctor’s amazing brain! Number one on the wish list – none other than Goku! 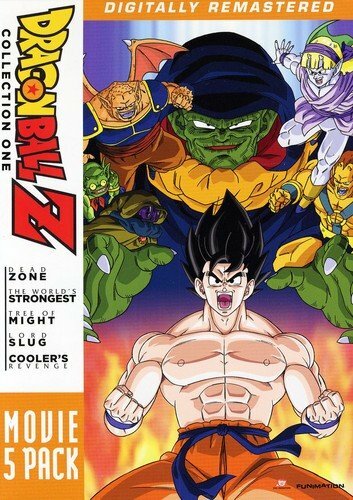 The Tree of Might:Devious doubles and terrifying trees keep Goku and friends busy in this epic motion picture experience! Turles, a Goku look-alike with very bad intentions, pits father against son with the help of a plant designed to consume the energy of an entire planet! Can Goku defeat his mirror image and the vile Tree of Might! Lord Slug:Goku and Krillin race to save Earth from a giant asteroid, but a far greater menace lurks in the shadows! Lord Slug, a Namekian with legendary powers, seeks to create a new home for himself in the wake of his banishment. Can Goku and his fellow warriors defeat this ancient enemy before all is lost?